Sometime in 2002, I was out taking photos for a forthcoming edition of The Housebuilder's Bible when I chanced upon a Bellway estate taking shape in Burwell, Cambs. The picture is on p165 of the current edition, No 6. The estate is done out in very trad styling and most of the elevations use sash windows. What troubled me was that I assumed these sash windows were timber but on closer inspection I reckoned that they might be uPVC. So I took a closer look at one…in truth I wasn’t really sure what they were made of. I was stumped. As someone who makes a living out of knowing about building homes, I felt ever so slightly humiliated and was glad there was no one there to share my discomfort. 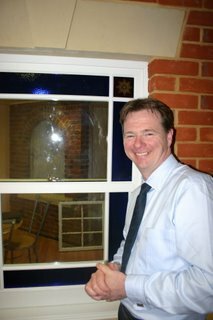 I had stumbled across the product of Masterframe, a very unusual window company based in Witham in Essex. The windows were uPVC but the uPVC itself has been through a process called foiling, a rough veneering, which gives the surface the feel and character of painted timber. I am not alone in my confusion. It’s very convincing and it fools a lot of people. Planning officers who are instructed from their first day at planning school that it’s “timber good, uPVC bad” have been known to have to eat humble pie after they couldn’t tell the difference. On Tuesday this week, I got to visit Masterframe as guest of their owner Alan Burgess (pictured here). He is a very affable and enthusiastic guy who has been working with windows all his life. 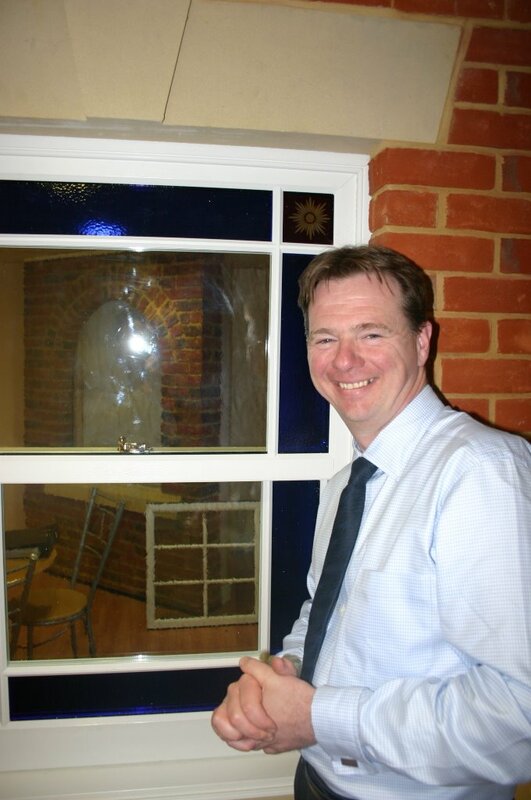 Something of a reluctant entrepreneur, he only started Masterframe because he had seen a brilliant example of a uPVC sliding sash window which no one wanted to put into production. He became convinced that there was a market for such a product and so began his quest to make the perfect sliding sash window – out of plastic. Masterframe now produce several hundred sash windows a week. They don’t install; they are mostly selling to installers, including some of the big boys like Anglian. Much of their product goes into the replacement replacement market. That is to say houses where the original boxed sash windows have been pulled out and replaced by aluminium or uPVC casements which are now past their sell-by-date. You can see the architectural devastation brought about by the replacement window market on virtually every street in the UK where the housing stock is more than 30 years old. For many people, the culprit is uPVC, but Alan Burgess never believed that there was anything inherently wrong with the material and has gone on to show that it’s possible to create or maintain authentic British styles whilst using new materials. If you want to know more, take a closer look at their website. There is a fascinating section entitled Glossary of Terms, broken down into 20 pages, which looks at the detailing that goes into their product, right down to the choice of the brush seal weather stripping and the placing of foam baffles. Every time an issue or a problem arises, they use it to improve the design. The attention to detail reminded me of one or two German businesses that I know of, but the desire to re-engineer a traditional product such as a sash window would seem to me to be something you might expect from the Americans. It makes Masterframe a difficult company to pigeonhole but, in turn, Masterframe make a mockery of the assumption that most of us Brits have, namely that we are hopeless at manufacturing. Masterframe will not deal with self-builders, as I found today (1st August 2007) when I asked for a quotation. Hi if you have a fitter who can spec the windows you actually want they sell direct - absolutely brilliant and no problems. Very happy customer. Master frame sash windows are probably the best sliding sash windows on the markete the service is good and product stands up to what they say. Master frame won't deal with self-builders of DIY customers however you may find bygonecollection retails the same product which is another one of their brands. Masterframe do sell direct to builders, self build, installers etc home owners normally require an installlation service, thats where their network of trusted (and vetted) local installers come in. However they do have strict payment terms but the product is in a league of its own, superb. For an alternative try Roseview Windows, who manufacture two different types of uPVC sash windows. Roseview's Rehau Heritage sashes are specifically designed for use in conservation and closely match the visual appearance of a traditional timber sash. Roseview's Eurocell range are designed for new build and modern projects. All are available with Secured by Design for enhanced security. KAT UK are another market leading company making the same product as Masterframe but typically they are not so expensive and sell direct to builders and developers if required, they too have a network of installers accros the entire UK as they do not install themselves. click >> Essex builders for more information . I felt very happy while readin this site. This was really very informative site for me. I really liked it. This was really a cordial post. Thanks a lot!.